비버아목(Castorimorpha)은 비버와 포켓고퍼, 캥거루쥐 등을 포함하고 있는 설치류의 아목이다. Carleton, M. D. and G. G. Musser. 2005. Order Rodentia. 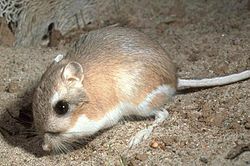 Pp 745-752 in Mammal Species of the World A Taxonomic and Geographic Reference. Johns Hopkins University Press, Baltimore. 이 문서는 2018년 5월 18일 (금) 08:09에 마지막으로 편집되었습니다.